J.C. Penny – Why Do Projects Fail? Know thy customer is the marketer’s prime directive. Understand your stakeholder’s is the Project Manager’s corollary. J.C. Penny is a national level department store chain in the USA that has recently demonstrated what happens when you ignore that simple piece of advice. In 2011, following a number of years of disappointing financial results, J.C. Penny recognized that they needed new leadership to revive their fortunes. To address the problem, J.C. Penny appointed the Apple executive who had been responsible for the development of the hugely successful Apple stores as their new CEO. Bringing a new perspective and impressive credentials (including time spent at J.C. Penny’s competitor Target), the new CEO came to J.C. Penny’s with a mandate to revive the struggling retailer. Having been a visionary at Apple, his bold moves to change the way J.C. Penny did business came as no surprise to many. He immediately set about building a new Senior Management team and among other major changes, tackled the often difficult issue of pricing. Over the prior years J.C. Penny had become reliant on coupons and sales to stimulate demand. Customers had grown accustomed to that model and knew that if they waited, most things they wanted would go on-sale at some point. While that may have retained a loyal customer base, unless managed carefully it is an approach that can easily undercut profit margins. To address the issue the new CEO set about trying to wean the J.C. Penny customers off of coupons and other pricing practices that undercut profitability. In place of coupons and ongoing sales, J.C. Penny adopted a set of simpler price points and color coded price tags. “Every Day” prices became the basic price that remained static now that coupons and discounting was discontinued. “Monthly Value” prices replaced the weekly sales and “Best Price” were used on the first and third Fridays of each month in an attempt to match up with people’s paydays. In addition, the old practice of using prices that ended in a 9 or 7 cents to indicate the type of sale was dropped. Instead all prices (no matter the type) ended with a zero. 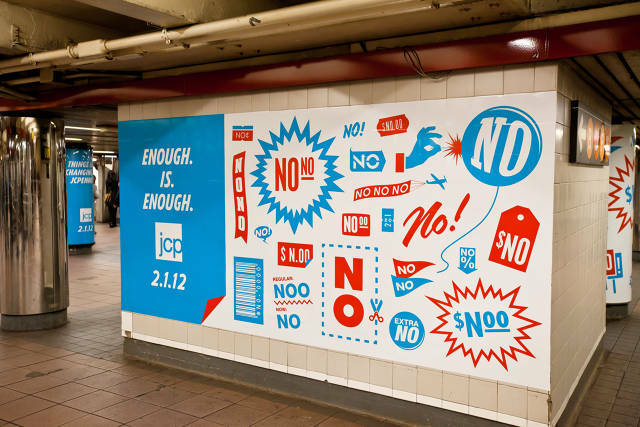 To mark the start of the new pricing strategy J.C. Penny started running ads that directly criticized the old practices of coupons and sales (see the “scream ad” and the “no gimmicks” billboard). Customers were unimpressed. Used to bargain hunting, coupon clipping and timing purchases to match up with the sales, customers were left confused. Because “Every Day” pricing meant that most items never went on sale the thrill of landing a bargain was gone and the removal of the 9 and 7 cent price tags resulted in difficultly identifying those items that were discounted. The effect on the bottom line was immediate. Revenues for the 2012 year dropped by a staggering 28%, a net loss of $1B mounted up and same store sales dropped by 32%. One pundit called J.C. Penny’s final quarter in 2012 “the worst quarter in retail history”. As for many failed projects the visionary leader paid for the failure with his job and J.C. Penny reinstated its prior CEO to try and save the store from oblivion. Coupons and sales are now back at J.C. Penny and the company published a new ad admitting that they had made mistakes and asking customers to give them one more chance. Lack of stakeholder analysis (failure to recognize how bargain hunting is a powerful force in the purchasing decisions buyers make). Lack of risk management (failure to prototype new pricing strategy in a smaller region prior to going national). Top down decision-making and a failure to engage effectively with the front line staff who understood the customer better. Prior successes (the Apple stores) result in over-confidence which sets the stage for future failures.